Ynez Johnston (American, born 1920). 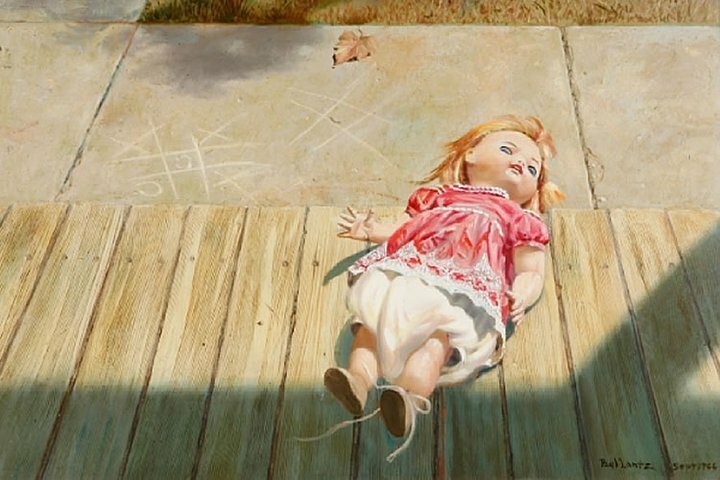 The painting by Ynez Johnston, is oil on canvas, the painting is titled; Crossing the Date-Line; it measures 28 3/4 x 32 3/4in; It is part pf the Farhat Art Museum in the Contemporary American Collection. Painter/printmaker Ynez Johnston was born in 1920 in Berkeley, California. She studied drafting, painting and printmaking at the University of California with Worth Ryder, Erle Loran and Margaret Peterson. Johnston’s work is characterized by “jigsaw” shapes reminiscent of primitive designs. Her unique style blends modernism and ancient art forms from her travels to Italy, Mexico, India and Nepal. She has also done 3-dimensional pieces in collaboration with her husband, poet and novelist John Berry, and with ceramic sculptor Adam Mekler. Her watercolors, oils and etchings of the 1950s and 1960s were rich with complex imagery, and displayed a disciplined and somewhat restrained use of color. The display of her paintings and etchings in an exhibition at the Museum of Modern Art in New York (1951) was the launch of her career as a successful artist. 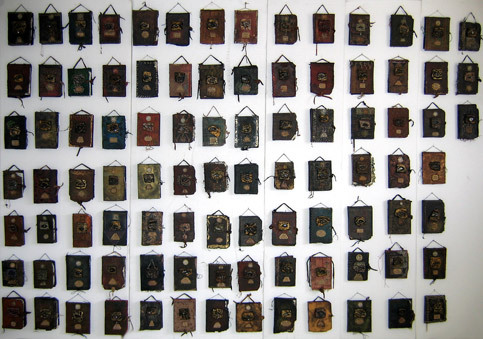 In later mixed-media pieces, she examined the tactile qualities of surface. 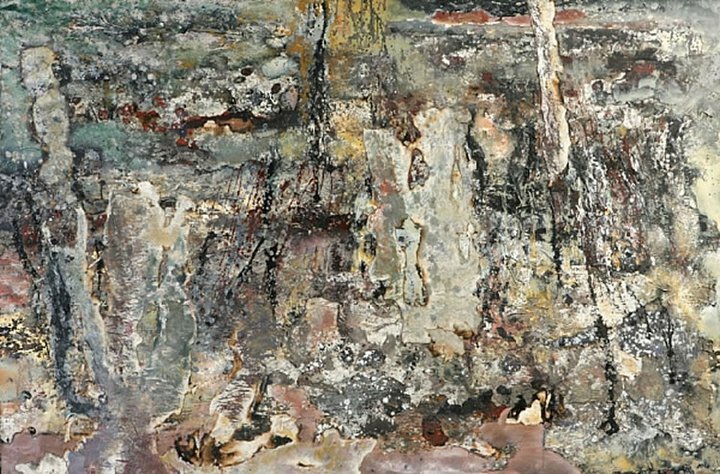 The paintings involve the combination, and occasional lamination, of diverse materialsoil, acrylic, dyes, encaustic on cloth, canvas, and raw silk. The colors are vibrant and the images are composite forms suggesting ambiguous architectural, human, animal and plant shapes. 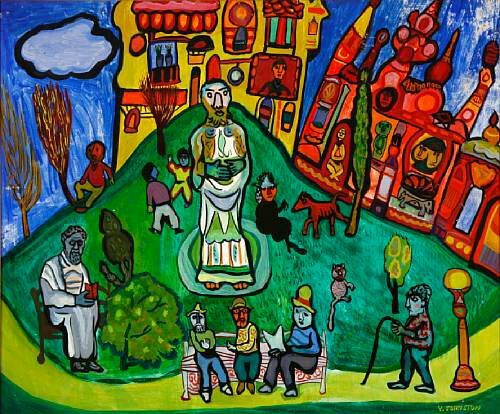 Johnston cites Persian and Indian art as influences along with such artists as Matisse, Miro, Klee and Picasso. She received a grant from the National Endowment for the Arts, a Guggenheim Memorial Foundation Fellowship, first place in watercolor at the Metropolitan Museum of Art in 1952, and Fresno Art Museum’s Distinguished Artist Award in 1992. She exhibited at the San Francisco Museum of Art, and at Mitsukoshi in Tokyo. Her work is in the collections of the Museum of Modern Art and the Metropolitan Museum of Art, in New York City. (Tobey C. Moss Gallery, West Hollywood) Ynez Johnston is an architect of fantastic realms. Though she may skirt reality, she never quite eradicates the concrete. She just disguises it. Her idiosyncratic vocabulary of forms derive from a collective cultural history. But references metamorphose into a unique fusion of elements that show no regard for the actual physical world. Throughout her career, Johnston has experimented with a variety of mediums that include etchings, lithography, oils, watercolor, paper maché, ink dyes, sumi on rice paper and casein. Crucial to her inventive composites are the influences of Mogul and Tibetan artists, Pre-Columbian stone carvings, artists such as William Blake, and the obsessive proclivities of Persian paintings. The melding of sources suggest a line between cubism, European surrealism and the over-all qualities of American abstract expressionism. Her personal evocations of abstract geometry are particularly reminiscent of the fanciful linear styles of Paul Klee and Mark Tobey. By combining mythic designs with the precepts of modernism, she evokes hybrids of universal forms and familiar landmarks. But they evolve strictly out of Johnson’s fertile imagination. . . a synthesis of outer and inner visions. As though spilling out of an overcrowded subconscious, a multitude of geometric forms and shapes transmute into intricate designs. Palace of the Snow Leopard , for example, is dominated by a form that looks like a cross between animal and architecture. The stylized figure bears a conglomeration of colorful designs and symbols. It appears a strange hybrid of a Mayan stylized animal and a Chinese horse. It is pure contrivance. A fifty-year survey reveals how Johnston’s stylistic developments have gone through cycles and mutations. But the vitality of her colors remain prevalent, and certain forms and themes have a continuous life span. The repetition of mythic shapes, particularly a mandala-like form, strengthen the enduring psychological power of ancient myths. Mythical urban landscapes also remain a constant throughout her oeuvre. In Arabia  her abstract depiction of crowded environs recall the surreal urban representations of Philip Guston. Through time, however, her evocative worlds become denser and more exotic. In Expedition  shapes resemble castles, temples, humans, animals and illusive symbols. I say “resemble” because this is a purely invented world. The use of black against vivid greens, golds and orange create a cohesive bond for the disparate images. The Green Nile  is replete with familiar Johnston elements. Here again, dazzling colors activate the relationship between man, cities, nature and symbols. Whimsical violet pyramids and middle-eastern architecture suggest cities in the sand. A green diamond-shaped island is set off by a sea of vivid blue, and a bright golden ground provides emphasis for a Mayan-type design. Surrounding shapes, set within fields of orange, red and yellow, evoke a pulsating energy. The influence of Tibetan tanka paintings and their penchant for borders is reflected in Sailing Around the Horn. Created with ink dyes on canvas and silk, fanciful depictions are set within borders of yellow, aqua and deep turquoise. Sculptures also show a propensity for hybrids. In the 1992 bronze, The Woman Who Waits by the Sea, Pre-Columbian and Asian influences appear prominently. A stylized woman stands upon a dog-like figure. Both are etched with a sundry amount of designs and figures. Johnston’s horror-vacuii style demands quite a bit of examination. But her amalgamation of images can extend the imagination of the spectator. Enigmatic forms rooted in ambiguous space give the illusion of dream metaphors. Juxtapositions that evoke associative meanings can transport viewers into their own fantasy universes. John Granville Coldoys Keane (born 12 September 1954) is a British artist, whose paintings have contemporary political and social themes. John Keane was born in Hertfordshire, England. He was educated at Wellington College (1968–72) and Camberwell School of Art (1972–76). He is a political painter, whose subjects often concern contentious political, social and military issues. 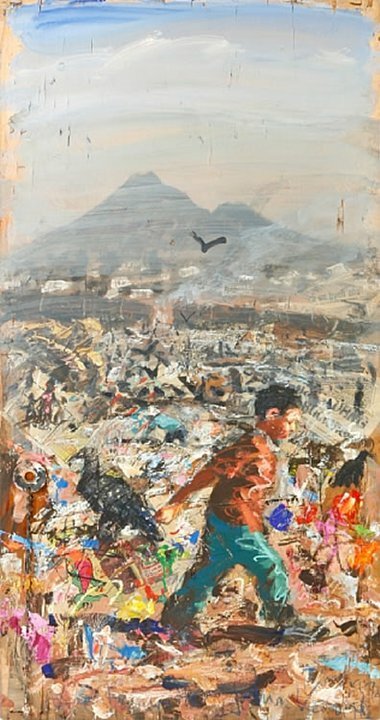 In 1990, the Imperial War Museum commissioned him as an official war artist in the Gulf War.2001–02, he exhibited paintings which were derived from an expedition with Greenpeace during their campaign in the Amazon against illegal logging.In 2002, he painted Mo Mowlam, former Secretary of State for Northern Ireland. The original idea was to represent her with other major figures in the Good Friday Agreement (Gerry Adams, John Hume and David Trimble), but four years of talks as to where the individuals should be placed ended with Trimble’s withdrawal and the plan was abandoned. In 2006, 57 Hours in the House of Culture was a show at Flowers East gallery, London, and Sakharov Museum, Moscow, about the Chechen War. More recent work, Guantanamerica, bases paintings about “issues of representation and dehumanisation of detainees at Guantanemo Bay” on low resolution internet files. He is a visiting research fellow at Camberwell College of Arts. The painting by Richard Harrison titled Hollowed Land is part of the Farhat Art Museum collection, in the British collection. Perhaps to define the guide it is best to start with what it is not. It is not a comic book in the traditional form of a segmented epical narrative. Each page can be torn from the book to stand on its own like a fractal containing the features of the whole, spelling “Occupation.” What the American woman and her daughter see is shown in a series of pictorial snapshots, each of which contradicts the sanitized and sloganized concept of the “Holy Land” — “a land without people for a people without land” — a Zionist lie pervasively promoted in the American mass media. The device of the presentation through innocent eyes, reminiscent of Salingers approach in Catcher in the Rye, serves to obscure the artist’s editorializing voice and at the same time revs up the shock of “discovery” by the “innocents”. It also prompts the viewer to wonder “But how can they not know what is being done in their name, with their tax dollars? How can anyone not know all this?” It is not an allegorical comic book in the manner of Spiegelman’s Maus, in which the predatory cats represent the Germans, the ruthless, greedy pigs stand for the Polish people and the defenceless mice for the Jews. Klotz’s guide does not indict any ethnic or religious group as a whole, but it forcefully and clearly blames an ideology: Zionism, which breeds, in a state arrogantly self-proclaimed as a “Light Unto Nations,” a culture of hatred. Legislated hatred and racism are epitomized by Israeli top leaders calling the Palestinians cockroaches, and by current leaders calling for their expulsion, a “final solution” to their desired aim of making Israel a state “for Jews only.” The artist sees Zionism as a misrepresentation of Judaic values. The guide is not, although it has that effect, a sarcastic travel brochure depicting highlights of the Zionist military occupation of Palestine any more than The Inferno is Dante’s tourist guide for Hell, although it would help a first-time visitor to cut through the miasma of propaganda down to the truth of Israel’s apartheid, occupation and war crimes. Finally, despite the numerous captions encapsulating data and facts of Israel’s systematic and ongoing land grab, ethnic cleansing and brutal oppression of the Palestinians as well as verifiable facts and figures related to the unlimited and unconditional American support (financial, military and diplomatic) of Israel, the book is not an illustrated pamphlet. Word and image are fused, whether the words are external captions or graffiti integrated within the image, into a visual whole. Nevertheless, Klotz herself considers the images simply as illustrations of what she saw with her own eyes over several years of close observation of life in occupied (and/or under siege) Palestine. In a sense the artist herself was at one time as an American visiting Israel for the first time. As a guest artist in residence at Mishkenot Shaananim — a non-governmental, non-political, international multicultural centre in Jerusalem — she first saw the realities on the ground in 1990. She returned many times for extended stays over the next five years, creating art programs, often in collaboration with Palestinian artists, and became familiar with the horror of Palestinian life under Israeli occupation only a street away (“just across Jaffa Street”), yet a world away from the relaxed and comfortable surroundings of Israeli life. She observed the moral compromise of many Israelis who had internalized the dichotomy of privately disagreeing with the government policies infringing on the Palestinians’ basic human rights without publicly opposing them. An advocate of human rights long before her Jerusalem epiphany, Klotz had spent time in Australia, deeply touched by the plight of the Australian aborigines. Ironically, when she left Australia to go to Israel for the first time, many of the aboriginal artists asked her for a great favour. Forcefully alienated from their ancestral culture, the Christianized Aborigines with no hope for redress in this life cling to the hope of help from their masters’ gods. They asked her to stick their written prayer in the Wailing Wall when she got to Jerusalem, which of course she did. Long after this memorable incident Klotz created a Portable Prayer Wall (marked Guaranteed and Made in the USA). As a way of making prayer intercession available to all, wherever they are, including those unable to reach the city now being cleansed, the Portable Prayer Wall has about it the inventive practicality as well as the wry irony of something that Mark Twain (one of the earliest anti-colonialism voices in America) might have come up with. Suzanne Klotz has an impressive body of work dedicated to the Palestinian tragedy and the destruction of Palestinian society and culture. The reason why Thy Kingdom Come deserves more space is not only because it is highly comprehensive and representative of her vision and talent, but also because she has been unable to publish it in the US. A digital documentary introduction to it, called The Other Side of the Holy Land, which she created in a college workshop, was attacked in the local press in her city (Sedona, Arizona) by the leadership of the City Arts and Culture Commission and described as anti-Semitic in a front-page article in the local paper. Equivalent to a persona non grata branding, this type of accusation creates an atmosphere in which an artist sees previous commitments reneged on by galleries and exhibit organizers, fails to find a willing publisher, and finds it increasingly harder to show and sell ones work. This is not surprising: after all, Americans now live in the time of the Patriot Act, and Israel’s perceived enemies are America’s enemies. A recipient of numerous prestigious grants, scholarships and awards previously, especially when her work and interest were captured by “safe” (lobby-less) causes like the plight of Australian aborigines, Klotz found that her guide attracted the FBI rather than accolades. The newspaper article culminated with a call from an FBI agent who claimed she was being investigated following a denunciation of being an Israeli agent. Under this pretext she was subjected to an interrogation related to her travels and activities, which made her feel as if she were in an Israeli airport rather than in her own home. Undaunted, Klotz participated in the College Art Association Democracy Wall exhibit in Atlanta in February 2005, where she showed images from the guide stamped CENSORED, together with enlarged quotes from the slanderous article that had described her work as anti-Semitic. She explains her persistence thus: “It is not about me. It is about the fate of 5.4 million Palestinian people and about our tax dollars that finance these crimes against humanity.” Her commitment to the Palestinian cause is above all else spiritual. A deeply compassionate and genuine humanist, Klotz believes that the spiritual teachings of all major religions are the same. She also believes that Zionism has not only perverted and misrepresented Judaism to both Jews and Christians but is also misrepresenting and demonizing Muslims and Islam to the world. Her current work is a collection of 99 books she is creating, each representing one of God’s attributes. As she is working on them, she says that each day she selects one attribute to meditate on to achieve a deeper understanding of the virtue and apply it during the day. One of her dreams is one day to be able to create an art salon in southern Lebanon where she could meet with women to create artworks that incorporate traditional techniques, crafts and calligraphy. The salon would ensure the preservation of traditional arts and culture and the art would further the understanding that whether one says Allah, God, or Dios, the meaning is the same. Our moral obligation is to all people, because we are children of the same God. Until then, underemployed and over censored, she continues to work with imagination, talent and an apparently inexhaustible reservoir of compassion, endurance and hope. A telling example of her vision, talent and resourcefulness was seeing a house under demolition in her hometown one day and realizing that it would make the perfect medium for her installation — a life-size depiction of a destroyed Palestinian home (or for that matter, Lebanese or Iraqi). Judging by the photographs, the installation, especially given the mountainous landscape of Sedona, so similar to many places in hilly Palestine, was eerily evocative and strongly moving. Mulham Assir is a Lebanese writer based in Beirut and Madrid.